Camino de Navaherreros, Madrid, Spain. 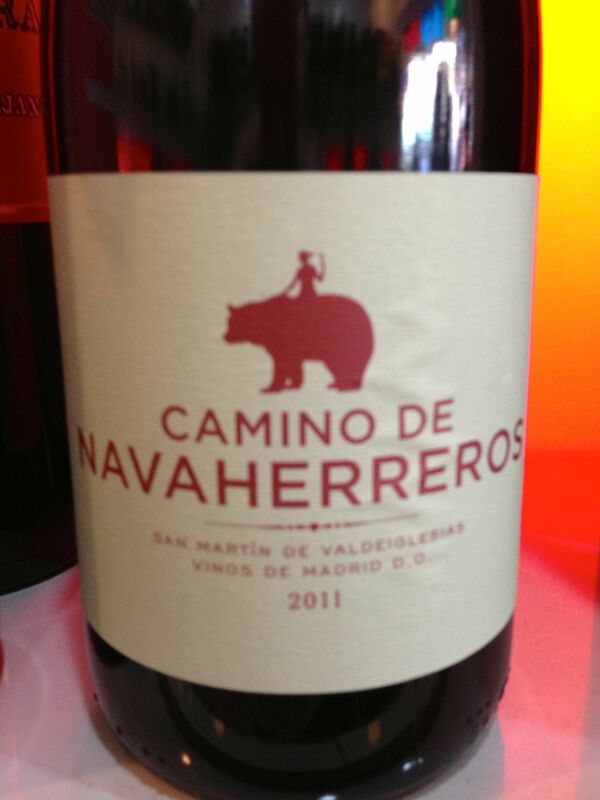 The last of the three wines we tasted at Wine Therapy was the 2011 Camino de Navaherreros. You read this label and feel like you should be able to find a good Spanish-to-English translation for “navaherreros” but it escapes both Google and me. Regardless, this high-alcohol (14.5%) grenache packs a helluva punch and you should grab one for your next barbecue. It bites back; a spicy cherry red that wants you to notice it from the very first tangy sip. Borne from 80-year-old vineyards outside of Madrid, grapes for the Navaherreros are grown from granitic soils and macerated for 25 days in wood, stainless steel, and concrete tanks before being aged in wooden vats. Some tasters have described this wine as, “The aromatic nose reveals fresh, acidity driven red fruit. In the mouth there are lifted flavors of dry, red fruit, cranberry and pomegranate, a little powdery quality, but definitely fresh with a hint of red pepper. Definitely lovely.” My thoughts echo not only the above, which I found spot on, but this gent whose review proceed mine too. Swirling the Camino de Navaherreros showed its depth; it is definitely not a Pinot Noir but far more in the Cabernet or Cabernet blend camp. We partook of this grape at the last stop of our food/wine tour and I wished I had a robust antipasta or steak to accompany it. Lately I’ve been all about Bordeaux but the Navaherreros presents a compelling argument for the Spanish reds. This entry was posted in Grenache and tagged Spain.